You’d Think They’d Have Learned By Now | Comics I Don't Understand - This site is now being updated daily at http://www.comicsidontunderstand.com. Please change your bookmark if necessary, and notify any web site with a link to the old address. Hey, I have the companion version of that book. Jenny, I strongly suggest you read Life and Times, then: The two volumes mesh together perfectly, and you won’t find a more enjoyable biography of Scrooge McDuck anywhere. As noted, both these books are great. 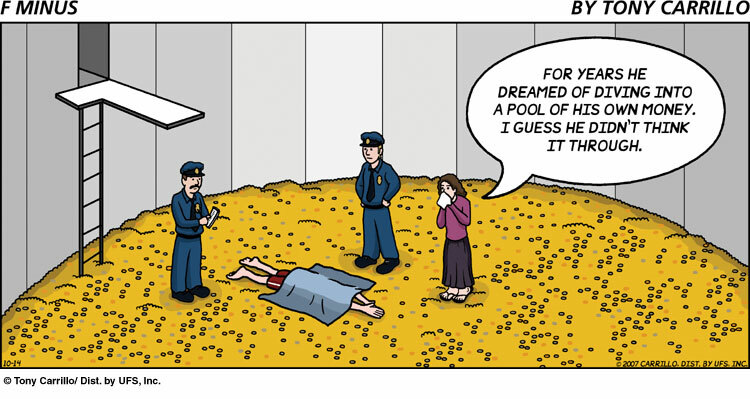 And actually, Scrooge showed that you really need to know how to actually dive into the money. This was how he defeated the Beagle Boys, by diving into the money and when they tried it, knocked themselves out. I’d say this is F-Minus on a bad day and Brevity on a good day, meaning neither strip is THAT funny. But even then, Brevity just can’t get a laugh out of me over F-M.